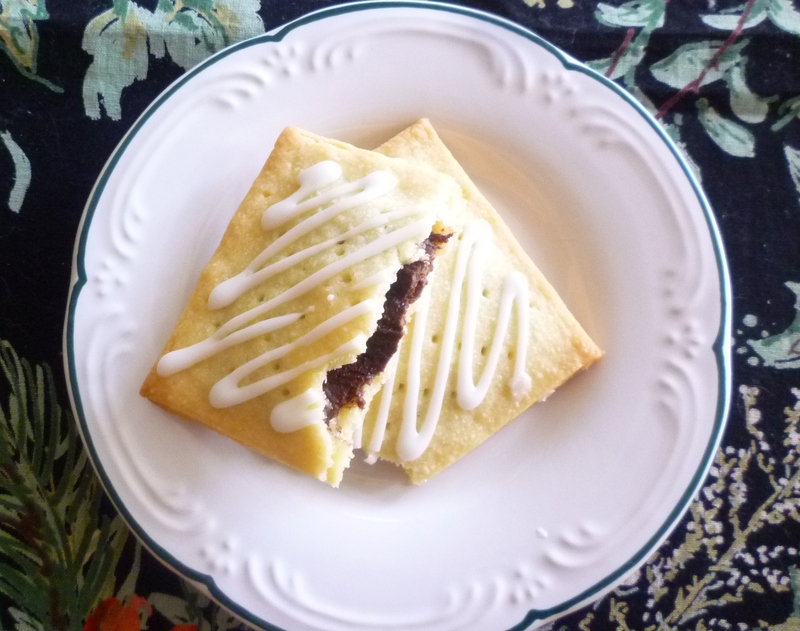 For many years I have wanted to include homemade "Pop-Tarts" in a baking class. This didn't seem like it would be a difficult thing to do, recipes for a homemade version of this processed American breakfast treat abound. 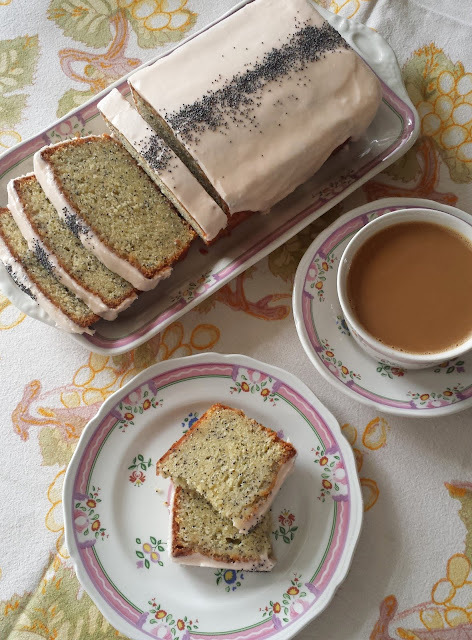 Furthermore, although they were not the sort of thing my mother allowed in the house on a regular basis when I was growing up, I loved them and maintained a taste for them far into my early adult years. I'm not quite sure when they disappeared from my cupboard, but even so they have continued to hold a fond spot in my taste memory. Last winter I finally decided to add them to an updated version of my breakfast breads class. After committing to teach them, I went out and purchased a box...to refresh my memory.... I hadn't had a "real" Pop-Tart in years and I figured if I was going to be making them I should at least have the "original" in mind. I admit I was astonished by how much I disliked them. All I can say is that tastes change. (I don't really think the Pop-Tart has changed). I found them to be bland and flavorless... But, I had already pledged to make them in a class, so I decided to make the Pop-Tart of my memory...a sweet, cookie-like pastry enveloping a fruity filling—more of a jam filled giant cookie really, than a pastry—basically what a Pop-Tart was meant to be. I mentioned at the first that recipes for Pop-Tarts seemed to abound...in the blogosphere...in cookbooks... But when I actually got down to the task of looking at the recipes that were available, I found that there was really only one recipe. Everyone was using pie dough (pâte brisée). In fact, most were using the exact same recipe for pie dough. This, in my opinion, is all wrong. 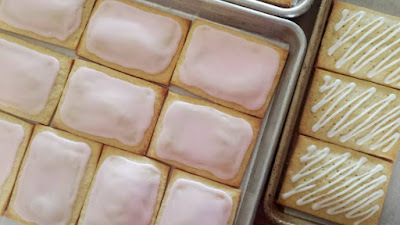 If you have ever tasted a Pop-Tart, you will know that the "pastry" is not a flaky pastry at all...it is much more similar to what the French call sablé and what Americans call a sugar cookie crust. It should be tender and crumbly...not flaky. In my final version of the crust, I used half cake flour and half all purpose flour. The purpose of this is to recreate the lower protein percentage of pastry flour—which is about 9%. I would not recommend using all all-purpose flour to make this dough. The resulting tarts are a bit hard and heavy. I would also not recommend using all cake flour as the tarts are too fragile. If you keep pastry flour on hand (I do not), by all means, feel free to use it. My insistence on the types of flour you should use might lead you to believe that these tarts are a bit persnickety. And the fact of the matter is, they are. In the course of making many batches of them I discovered that they had a disconcerting tendency to spring a leak in the oven. When made with the oft-used pie crust-style crust, the jam leaks out the sides (at the seams). 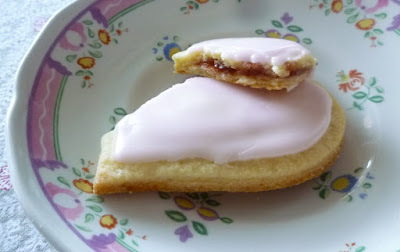 If you look around at some of the bloggers who have made jam filled Pop-Tarts, you will see that there is almost always jam all over the baking sheets. ...but it's nothing that a little frosting won't fix. While my 3-2-1 dough tarts didn't leak out the sides, they occasionally did split on top. If you are going to frost the Pop-Tarts, this is not an issue at all. But if you are not, then you don't want them to burst. In the end, I discovered a list of conditions under which they will not split...and conditions under which they almost always will. I have listed these in the recipe and the notes at the bottom of the recipe. It is worth noting that one of the reasons for my preference for an all purpose and cake flour blend was that all of one or the other seemed to create conditions under which the tarts wanted to split open. You may be wondering if my homemade Pop-Tarts will stand up to the toaster. I'll be honest and admit that I never bothered to toast the commercial ones...I always ate them straight out of the little silver bag...but I did test my homemade ones in the toaster. I found that if they have not cracked...and have not been frosted...they are just sturdy enough to take a quick warm up in the toaster. They should not be toasted if they have been frosted since the powdered sugar frosting will melt (and most likely drip) in the toaster. 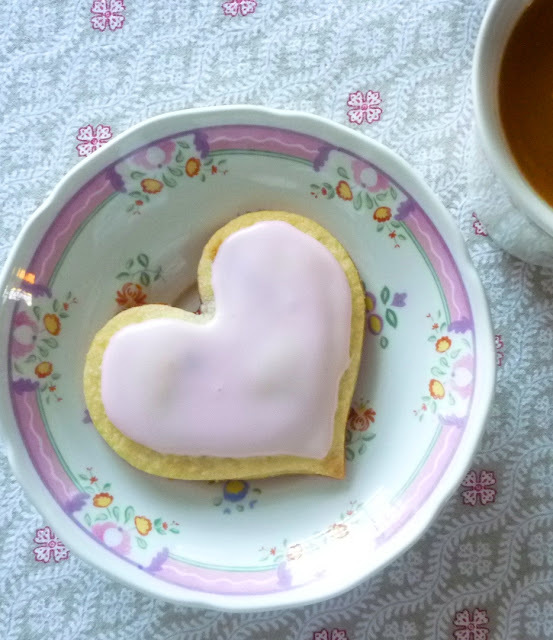 Because I was testing my Pop-Tarts around Valentine's Day I decided to make a few Pop-Tarts in the shape of a heart. As it turns out, this has become my favorite way to make them. These days, Pop-Tarts seem a bit too sweet for breakfast. They are far more suited to an afternoon snack with a cup of coffee...or tea....and for this purpose the traditional size seems a bit large. Moreover, the hearts make an extra special treat to give in honor of the day. Individually wrapped with a festive bow, they can be given to a friend...or tucked in a briefcase or lunch box. They are a simple and sweet way to tell someone you love that they are special to you. (the “clump” produced will immediately fall apart into “meal” if lightly pressed). 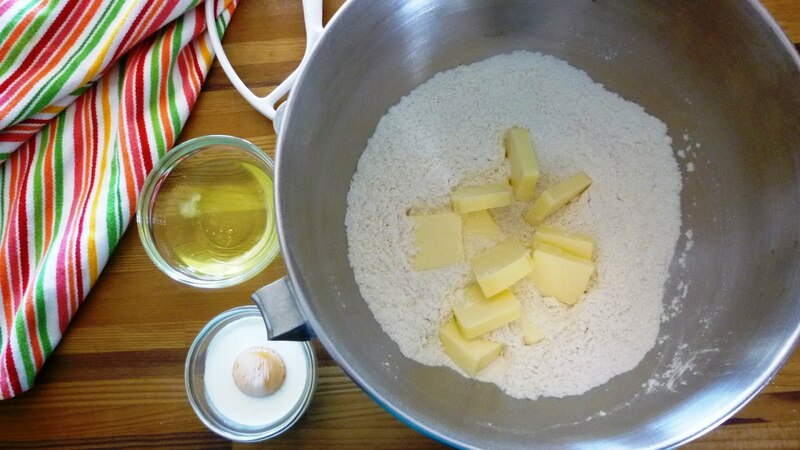 Combine the yolks and cream and drizzle over the butter-flour mixture. If working by hand, fluff with your fingers until clumps form, then turn out onto a lightly floured counter and knead just until the dough comes together. If using the stand mixer, run on low/med-low until the mixture comes together into clumps. Turn out of the mixer bowl and knead once or twice to bring it together. If the room is cool, the dough will be firm, but malleable and may be used right away. If the room is warm, chill until cool and firm….but not rock hard. If the dough has been made ahead and chilled and is rock hard, let it sit at room temperature until it is malleable. rectangle that is at least 8-inches by 12-inches. It will probably be larger than this….it is important that it not be too thick. Brush off the excess flour and using a pastry wheel, trim the dough to the aforementioned 8-inches by 12-inches. Cut this large rectangle into eight 4- by 3-inch rectangles. Take half of the remaining dough and press the scraps into this fresh piece. Roll the resulting chunk of dough out as for the first third. Repeat with the remaining piece of dough combined with the scraps from the second rolling. If you have a lot of dough left, roll it out and cut as many 3- by 4-inch rectangles as possible. You will have anywhere from 24 to 28 rectangles, depending on how thin you rolled the dough. Half of the rectangles will be “bottoms” and half will be “tops”. Spread the bottoms on a parchment-lined baking sheet. Prick the tops in a decorative fashion with a fork. Brush the bottoms with the egg white. Place a level tablespoonful of jam on each bottom and use a small spatula (or your fingers) to spread the jam out to within a scant half inch of the edges. 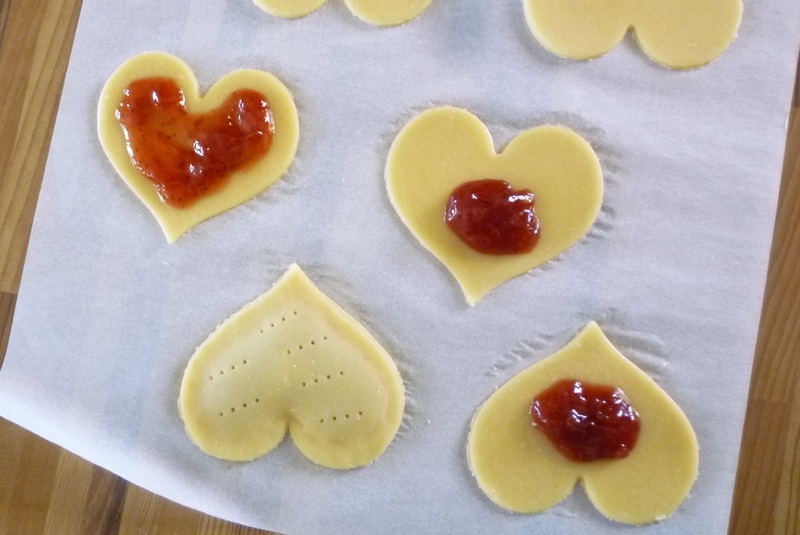 One at a time, carefully lay the tops over the jam-covered bottoms and press evenly to seal. If you like, use a chef’s knife or pastry wheel to trim the pastries so that they are uniform and even. Transfer the sheet pan of sealed and trimmed pastries to the freezer and freeze until hard all the way through—at least an hour. When ready to bake, preheat the oven to 350°. Place 4 to 6 pastries at a time on room temperature, parchment-lined baking sheets, spacing evenly (you don’t want to crowd the sheets). Bake until the pastries are just beginning to turn golden brown on the edges and the tops are set—about 20 minutes, rotating the pan from front to back, half way through the baking time. Briefly cool on the baking sheets before transferring to wire racks to cool completely. If you like, when the Pop-Tarts are cool, frost or drizzle with powdered sugar glaze. Makes 12 to 14 Pop-Tarts. Powdered sugar glaze: Place 1 cup (115 g.) powdered sugar in a small bowl. Add 4 t. of milk and 1/2 t. of lemon juice and mix until smooth. You may replace the lemon with vanilla…but I found this too be a bit too sweet for my taste. The pastry is easy to work with if your room is cool. If you are working in a warm room, you will have to keep any portion of dough that you aren’t working with in the refrigerator to keep it cool. Occasionally the tarts will crack on top when baking. If this happens, once they are cool, simply frost with the powdered sugar glaze to cover up the fissure. While not perfect, they still taste great. It was my experience that red fruits like strawberries and plums tended to cause the tarts to crack most often. Blueberry on the other hand didn’t tend to act this way. Nutella and other paste like fillings will not crack or ooze at all. Baking the tarts from frozen discourages cracking. You can of course make Pop-Tarts in any shape or size you like. A good size for a "mini" Pop-Tart is 2 1/2- by 3-inches. You will need a level half tablespoon of jam for this size. For my heart shaped Pop-Tarts, I used a cutter that measures 3 1/2-inches across. This holds 1 1/2 to 2 level teaspoons of jam. These smaller tarts only need to bake for about 15 to 16 minutes. Be warned that the mini Pop-Tart (when made with jam) will split and ooze about 75% of the time. The heart almost always oozes a bit. But in both cases, frosting covers the fissure so that no one but you will be the wiser. One recipe makes about 18 to 20 hearts or mini Pop-Tarts. 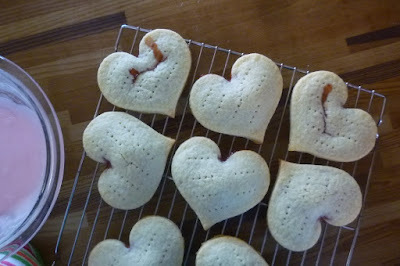 The recipe halves very neatly...to make just 6 or 7 regular Pop-Tarts or 8 to 10 mini Pop-Tarts or hearts. 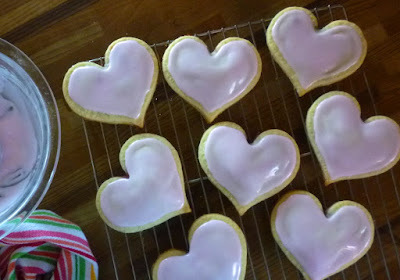 My oven has unusually strong bottom heat, so when I bake these I use insulated baking sheets. If you have a similar problem and don’t have insulated sheets, simply stack one baking sheet on top of another to create an insulated-style sheet.